At the end of October 2018 OEPass and its sister project, MicroHE, were invited to be introduced at the first multiplier event of the MOONLITE project. The recognition that these projects have the potential to make welcome changes to the educational landscape, and make a positive impact on the lives of Europe’s migrants and refugees, was a sign that our dissemination efforts are bearing fruits even in niche circles of HE providers. It is a pleasure to announce that the first phase of testing the Learning Passport was successfully completed by mid-October 2018. The purpose of the OEPass Learning Passport is to systematically collect a set of precisely defined data and information about open education experiences which were identified as decisive factors for their recognition. The form’s content is closely related to the ESCO classification of European skills, competences, qualifications and occupations. The draft template of the Learning Passport is intended to test with real education providers as to what extent their existing (micro-)qualifications can be transparently classified for subsequent recognition by third parties (i.e. by other Higher Education Institutions and/or prospective employers). For the purposes of this piloting exercise, a credential is defined as a certification of a qualification. During the course of the internal testing, each project partner filled in the form by means of a real online course at his or her institution. The provided feedback is now evaluated in a feedback loop. The Learning Passport will be adjusted in the next steps and will be presented to the public soon. On the 25th of October in Barcelona, at the 2018 EDEN Research Workshop titled “Towards Personalized Guidance and Support for Learning”, the OEPass project has introduced, for the first time in public, its Learning Passport to an enthusiastic conference audience. In two consecutive workshop sessions, one in the morning and one in the afternoon, we had the opportunity to collaborate with almost 20 educational practitioners. Working in small groups on the various possibilities of issuing and recognition of micro-credentials allowed space for discussions and a stimulating round of questions at the end of each workshop. 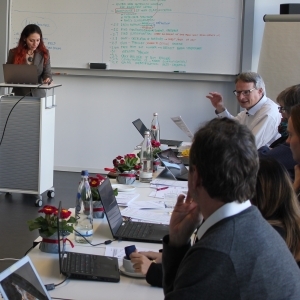 From the 11th to the 12th of October OEPass partner DHBW presented our project to the German National Agency, DAAD, at a face to face meeting held in Bonn, Germany. DAAD acts as the National Agency for EU Higher Education Cooperation in the Erasmus+ programme and its predecessors, and it is one of the most experienced agencies in Europe. At the event poster sessions were organised in small groups, where current projects could briefly introduce themselves. This was a great opportunity not only to present OEPass, but also to participate in valuable networking activities. The 2018 EDEN Research Workshop, titled “Towards Personalized Guidance and Support for Learning”, will be organised in Barcelona on 24-26 October. The workshop focuses on the crucial and changing roles of teachers in supporting student learning in the digital world, and with its Learning Passport ready for public review, OEPass will have a highlighted position within the conference programme. You are kindly invited to participate in a 2 x 90 minutes workshop on the 25th, where the project representatives will explain how the Learning Passport facilitates the recognition of open education credentials in Europe. Higher Education is changing in nature. A new way of thinking is evolving, shaping a new paradigm of HE based on modularization. In the centre of this paradigm, the vision of personalized patchwork pathways of higher learning, qualifications and certification is manifested. The OEPass workshop will show how this vision evolves, and analyses its consequences for HE institutions, outlining also the challenges of our current practice. The explanatory presentations will be followed by an introduction to the Learning Passport and conclude with a practice session about the use of this new tool. More information will follow on the Research Workshop website soon. Research Workshop participants can register to the OEPass workshop here. If you are registered as a student and also take part in the OEPass event, your registration fee will be reimbursed.